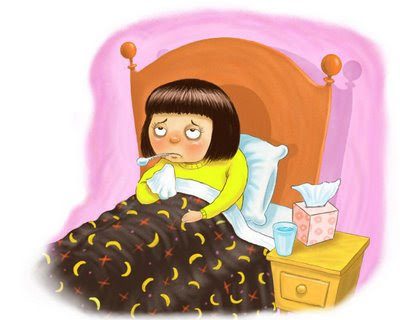 Today, I'm so glad to say that I no longer feeling pre-fever. The headache is gone and most of all, I don't have sore throat! xD So glad and soooooo utterly happy that I got to wash my hair, finally, just now, after 8 days of no-washing. Yes, 8 days, 1 week and 1 day, that long of no-washing my hair. Believe it. My hair felt soooo dirty and flakes started to come off when I scratch my scalp. ♥ Touch nothing of cold atom. Hehe, I mean, touch nothing of cold- cold water, cold food (physically or internally) and cold drinks. ♥ Drink warm water. Note: WARM WATER, not room-temperature water. Drink a lot of it, more than you normally do. ♥ Sweat. Yes, sweating as in perspiration. Think you shouldn't exercise because you're sick or having fever? Wrong. Exercise boosts metabolism and FYI, your immune system. Ask any athletes how many times per year they get sick- not the ones who smoke crack or smoke cigarettes. ♥ Gargle with salt or apple cider. If you have that sore throat (like I did), gargle as frequent as you can. Why? It can kill bacteria and is used for many purposes from cleansing the colon to killing bacteria on meats. Even my doctor suggested me to do so. Just fill a glass with the amount of water you desire, then add salt until it tastes super salty. The saltier, the better. As for apple cider, a teaspoon or two would do for a 1/4 of a glass. When you gargle, make sure to hit the water to the sore area. Feel pain? Good. ♥ Take vitamin C and other vitamins. This is obvious, you're immune system is fighting the bacterium army inside of you and they sure can use some of the vitamin C.
♥ Think you just better off to the clinic and get some medicine? By my guest, but FYI Fact: antibiotics do kill bacteria, but they kill ALL 100% of them, as in terminate all the bacteria species in your body, and that includes the GOOD BACTERIA too. Another FYI: I don't take panadol. I never take but once in my whole entire life- during studying in the academy, once for my first time headache where I thought I was going to die for I didn't know what a headache was and felt like. ♥ Eat less spicy and oil food. Not only this is good for your complexion, this is good for your aching throat! I ate spicy food once and it was no good I tell you. ♥ Be hygienic- MORE. As in wash your hands more often and always before and after having your meal, especially if you're to touch your food. ♥ Stay away of smoke and always keep your room well-ventilated. Try not to keep your mouth open for too long, I think I got my flu from that act. Be sure to minimize your exposure to airborne bacteria. ♥ Itchy throat? If you cough for too long, you can have your throat bleed. I had this last time and yes I saw blood when I spat out kahak. Terrible experience. To avoid this, take herbal candy. I tried Nin Jiom herbal candy from Watsons and it did the trick to stop the coughing I had last time. Too much to follow? Nevermind, take baby steps. My "worst sickness is the sickness of my neck", according to a Taurus reader, and it's true. I ever had fever for about 2 weeks and it was my first month of the job- imagine that! xD So when I'm sick, I get very strict on what I eat, what I wear, if the aircond's on...etc etc. wow..8 days? ?that's kinda serious i reckoned..lucky me..it's day 3 and im having a speedy recovery already!^_^.